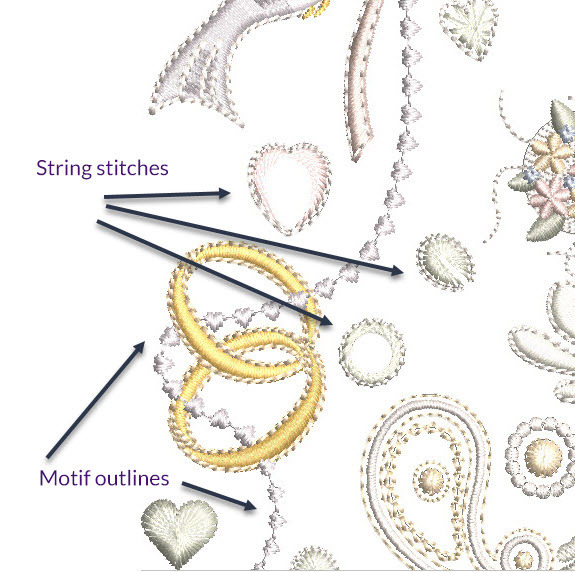 It is easy to just pick colours at random, stitch them out and then be unhappy with the result, just as it is commonplace to add too many colours to an embroidery design and spoil its beauty. 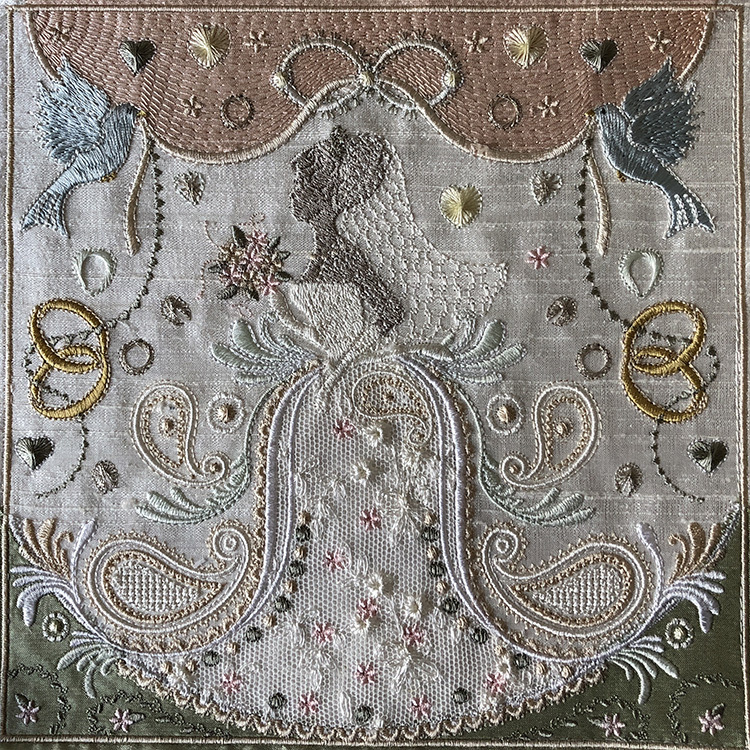 I have been stitching out samples of my new bridal design which comes as a simple crazy quilt block, and have been discovering the dramatic differences the right colours make. These designs celebrate the wedding of Harry and Meghan, the Duke and Duchess of Sussex. 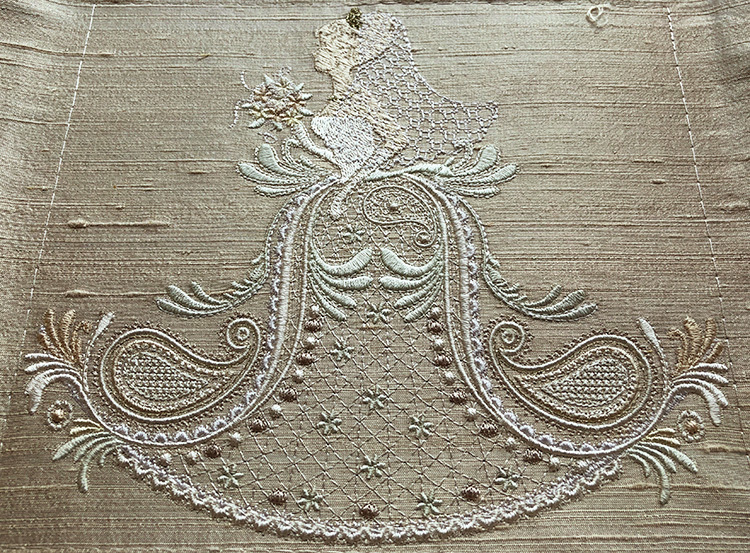 Although there would be a temptation to stitch out this unique bridal embroidery in white, a great deal of detail would be lost in doing that as the various segments would merge and be lost. Similarly when colours are too varied some may stand out, drawing the eye inaccurately to the wrong section breaking up the design. I am just as fussy about the colours I use, as much as the quality of my stitches. However I confess that I often change my mind about colours as I am stitching out and some of these random selections (or mistakes!) work and others are very disappointing. This is my stitch out of the smaller quilt block which measures 5″ x 5″. You can see that I made an attempt at adding a veil which turned out a bit weird but on reflection I should have gathered it half way down as well as just at the top. Manipulating the tulle was difficult especially on this smaller block. I considered adding the veil after the block was finished but I think it needs to be anchored not just at the top but all around. The rings were stitched out in gold metallic thread and I didn’t like the result as the metallic thread makes them appear larger and when I stitched the outline I think it made the rings appear untidy. I had stitched the birds out in Sulky Rayon 1151 Powdered blue tint but decided the blue was not in keeping with the remainder of the colours and in this stitching found Sulky Rayon 1236 Light silver was better. Here you can see the bodice which I stitched out in a sparkly metallic thread, which I thought spoilt the elegance of the design. That was an impetuous decision I regretted. There is not so much detail in this block as the smallest elements have been removed. 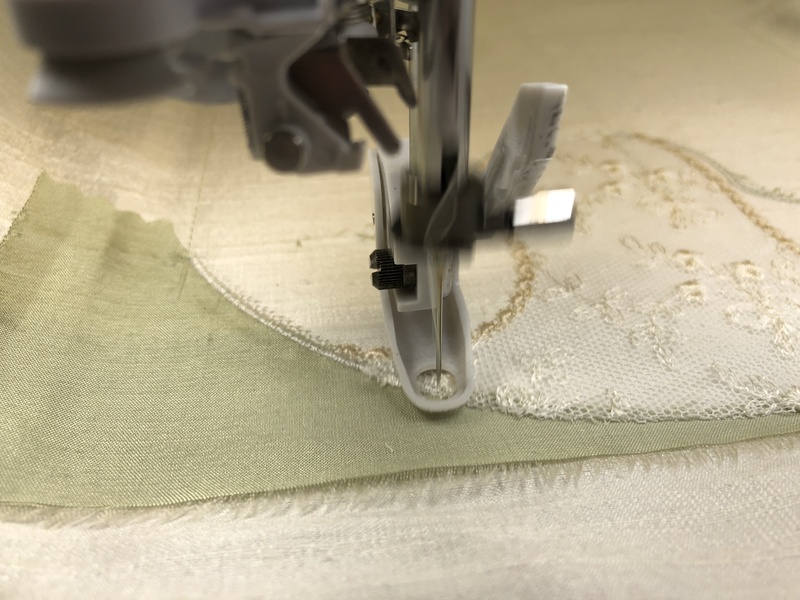 I attached the same fabric for the base and also for the canopy above the bride and used the motif fill stitches for the skirt rather than attaching lace as an applique. This is the larger of the blocks, stitched out in a 8″ x 8″ hoop. I was happier with this one overall and would like to emphasize that this will get you a better result, as the smaller design has been resized. If you are able stick to the large block so all the details on the bride are visible. There are some interesting new stitches too in this larger block, which have had to be excluded from the 5″ by 5″ block. My new software can now create string stitches for Paghadi, which can hold tiny mirrors but so far I have not been able to source out small enough ones. I have created the hearts with these large stitches too, and the effect is wonderful. Although some of these interesting shapes have outlines you may choose to not stitch them by editing them out of the design. I am now able to create motif runs that decrease in size, hence the run of tiny hearts falling from the rings get smaller and smaller. Within this set of designs I have included two brides, one with a sleeveless bodice and gloves, and another bride with a sleeved bodice with a bateau neckline, which reflects Meghan’s dress. 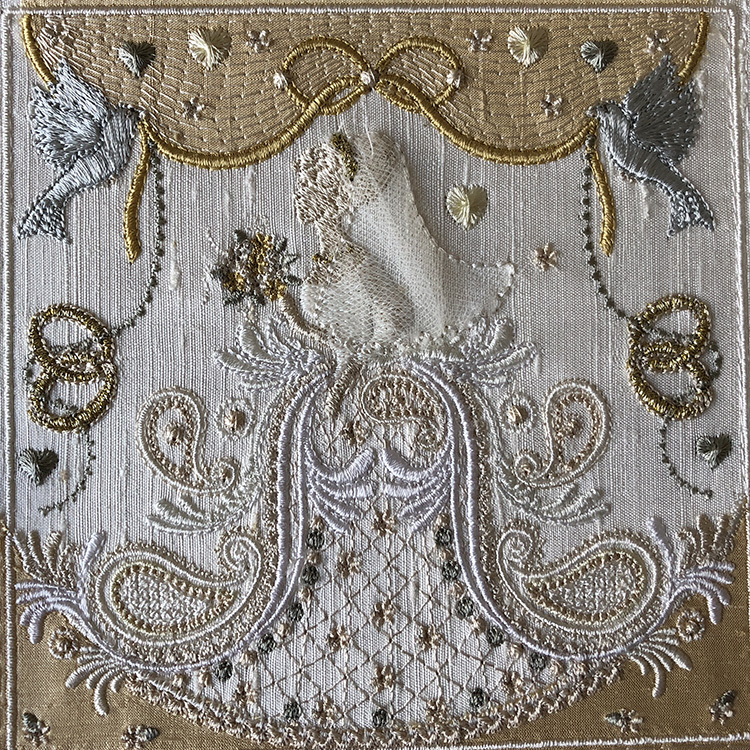 Each of these designs features in each size of crazy quilt blocks and has a different tiara. This represents what can be achieved using the palest of threads. I toned down my selected colours for this bride, using Sulky Rayon 1086 Pale Sea Foam instead of 1063 Pale yellow green, and 520 Bone instead of 1082 Ecru. You may have noticed that I don’t embroider with pure white thread, (I still have my original spool of white thread) preferring 1002 soft white and 1071 Off white. I also added 1022 Cream and 1085 Silver along with a touch of pale gold, Sulky Rayon metallic 7003. 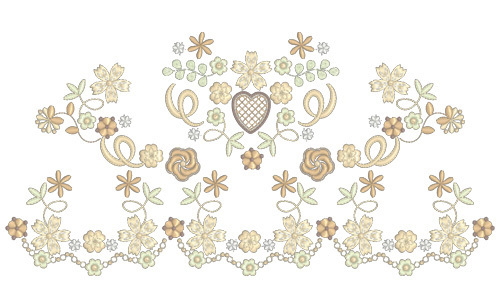 This was stitched out on my favourite silk which forms the background on my new website. See more photos in my new style gallery. 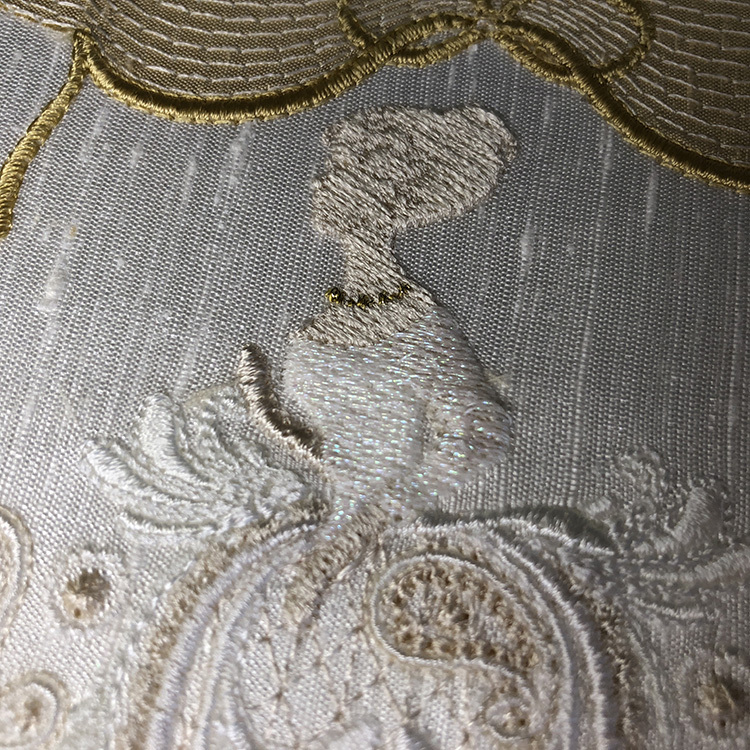 This entry was posted in Discussing machine embroidery, New Designs and tagged Bridal embroidery, Crazy quilting, development of embroidery, embroidery on silk, machine embroidery, The importance of colour. Bookmark the permalink. Hi Hazel, I loved your discussion on the results you obtained using various colors, hues, and types of thread and how they affect the different parts of a design on a variety of different materials. The photos you attached to emphasis tour results are phenomenal. Capturing the details of my stitch outs on camera can be difficult but my iPhone does very well. Thank you for teaching more about color. Your pics really show how color makes the difference. Colour is so important. I should do a tutorial. Yes!! I think with all of your wisdom, we would gain so much from a tutorial on color….this is the hardest part of embroidery to me! I do so appreciate your presentations for you share with us the do’s and don’t’s that you have experienced. I print them out and save for future reference! Thank you so much. That’s so sweet of you. I am on a learning curve as much as all of you. I must do some YouTube videos for you all, but there never seem another hours in each day. The right balance of colour is as important as the quality of stitches. I love these designs….I have tried to pre-order, but have been unsuccessful. Can you assist? I contacted you personally as I always do for individual problems. Enjoy the designs and share what you create with them. A very lovely embroidery. I especially like the ouline around the wedding rings to accentuate them.